A Babylonian tablet contains a completely accurate trigonometric table more than 1,000 years before Pythagoras lived. A donation to the Israel Museum has more than doubled the total number of gold coins on display in Israel. James Davila has been doing a series on the Jordanian lead codices: Part 1 (the materials test); Part 2 (the inscriptions); Part 3 (the Abgar-Selaman epitaph). Though most tour groups don’t make it to Eilat on the Red Sea, Wayne Stiles explains why it is important in the Bible. David M. Weinberg argues that the Israeli government should fund the Temple Mount Sifting Project so that it can continue. Carta has published some great new books (and maps) recently. I plan to recommend some of them here when I get a chance, but you can take a look at the latest offerings now. Texas International Bible Institute has created a series of 360º videos on-site at various locations in Israel. You can start here and select from the list on the side. Eisenbrauns has announced a forthcoming festschrift entitled Studies in the History and Archaeology of Ancient Israel in Honor of Israel Finkelstein (Nov 2017). Eric Cline is on The Book and the Spade discussing his latest book, Three Stones Make a Wall. The 20th Annual Bible and Archaeology Fest will be held this year in Boston. The Routledge Encyclopedia of Ancient Mediterranean Religions is reviewed positively here (but it’s expensive; I don’t think I’ve seen a Kindle book for $408 before). A 6th-century mosaic discovered near the Damascus Gate in Jerusalem has a Greek inscription mentioning Emperor Justinian. A 1.5-minute video is here. The pottery restorer of the Gath excavations shows how to restore an ancient pot in in a 1.5-minute video (but you might want to turn the sound off first). Authorities have frozen plans to build a new neighborhood over the abandoned Arab village of Lifta. Those who know the history here may get a kick out of Rami Arav’s declaration that “Archaeologists should be led by the evidence, and not force the evidence into their theories.” His new piece entitled “Bethsaida Controversy” is a frontal attack on the recent el-Araj claims. Check out the latest www.HolyLandPhotos.org Newsletter from Carl Rasmussen here. If you like this blog and you use Facebook, you might consider joining the “Nerdy Bible Backgrounds and Bible Geography Majors” group. “Ancient Babylonians living almost 4,000 years ago could have predicted Monday's total solar eclipse.” Here’s how. Two of my partners on the new Photo Companion to the Bible witnessed the eclipse in different parts of the United States. Steven Anderson shares his experience here, and the photo below was taken by A.D. Riddle. Last night, on a whim, I jotted down some thoughts on the new Photo Companion to the Bible and sent them out in the BiblePlaces Newsletter. The response has been terrific. If you didn’t see it already, you can read it here. A first-century AD tomb in Irbid, Jordan, will open to the public next month. The unique tomb contains oil paintings, transcriptions, and drawings. A Hellenistic temple and network of water tunnels has been uncovered at Gadara. An analysis of a water pipe from Pompeii suggest that the Romans probably experienced daily problems with vomiting and diarrhea, as well as liver and kidney damage. The problem wasn’t lead, but the acutely toxic antimony. Cf. 1 Timothy 5:23. The latest issue of Biblical Archaeology Review has a number of articles of interest, including the capital city of Samaria, Hebrew on Herod’s time, and NT figures known outside the Bible. The William Kelly Simpson Memorial Colloquium will be held at the Yale Peabody Museum of Natural History on October 7. The Israel Exploration Society is having a clearance sale for all final reports of the Masada excavations. Each of the 8 volumes is reduced to $30 plus shipping. Among the resources for Accordance on sale now is the three-volume Archaeology of the Land of the Bible series (by Mazar, Stern, Meyers, and Chancey). GTI Study Tours is a unique travel agency that I’ve heard rave reviews about. They are offering a highly-discounted “Pastors and Christian Educators” Study Tour of Turkey in February with Mark Strauss. If you don’t subscribe to the BiblePlaces Newsletter, or if some helpful filter put it into a folder you never check, you can read it here. Or go straight to the big news of our new photo collection here. My biased opinion: it’s our best collection ever. It’s on sale this week. If you ever think you’ll need photos of the Gospels, grab this collection now because the price is low and you’ll receive free updates for life. The suggestion that el-Araj could be New Testament Bethsaida received lots of media attention, not all accurate. I’d recommend this report by Jeffrey Garcia and Steven Notley at the CSAJCO website. An on-site interview with archaeologist Mordechai Aviam is posted at CBN’s Facebook page. The Today show sent a correspondent to the site. National Geographic sets some of the record straight. The Times of Israel looks at the two sites laying claim to the name of Bethsaida. Jonathan Adler guides a video tour of a 2,000-year-old stone quarry that he excavated in Galilee. The Jerusalem Post provides a written report on the excavations. The Abel Beth Maacah team shares a photo album from the 2017 season. Nadav Na'aman argues that Khirbet Qeiyafa was not a Judahite city in a recent article in the Journal of Hebrew Scriptures. Authorities are planning to stop the flow of sewage down the Kidron Valley. The Wall Street Journal (subscription req’d) traces the path in which ISIS looted artifacts make their way out of the Middle East. Excavations at Carchemish have uncovered 250 Hittite bullae this year. Excavators at Tell Tayinat found fragments of a large female statue at the citadel gate complex. Now online: Egypt’s Ministry of Antiquities’ Newsletter for July 2017. Wayne Stiles considers the strategic value of the International Highway (aka Via Maris). Ferrell Jenkins shares a couple of beautiful photos of ibex at En Gedi and Ein Avdat. Leon Mauldin explains the location and importance of Akeldama, the Field of Blood. Cynthia Shafer-Elliott is on the Book and the Spade discussing “Canaanite DNA” and her excavation work at Tel Halif. We will be making a big announcement in the BiblePlaces Newsletter on Monday. You can sign up for a free subscription here. This series of posts examines the historical reliability of the New Testament books of Luke and Acts by comparing these books to other ancient textual sources and the archaeological record. Supplemental information of additional interest is often given as well. 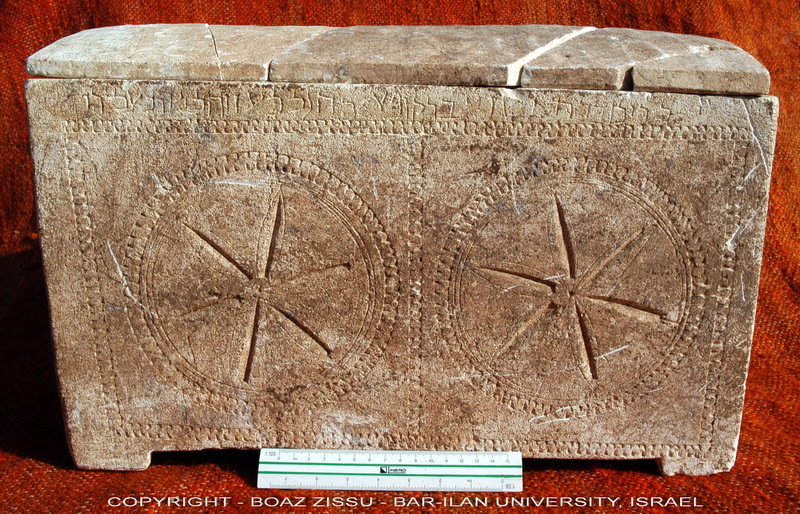 Additional information on this artifact is provided by the Israel Antiquity Authority. 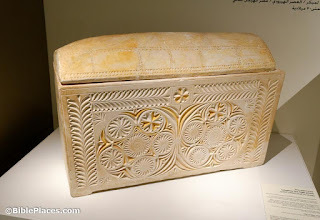 Further, a second ossuary inscribed with the name "Caiaphas" was found in Israel in 1990 and can now be seen in the Israel Museum in Jerusalem. Though not entirely certain, this ossuary is commonly thought to belong to the high priest Caiaphas himself, and the bones found within (those belonging to a 60-year-old man) may have been those of the high priest. The following picture depicts this second ossuary, and an article in the NY Times from 25 years ago announcing its discovery can be found at this link. Of additional interest is the fact related by the 1st-century Jewish historian Josephus that Caiaphas was also known by the name "Joseph" (Antiquities 18.4.3). Because of his high profile in the New Testament, Caiaphas has often been depicted in various works of art over the centuries. 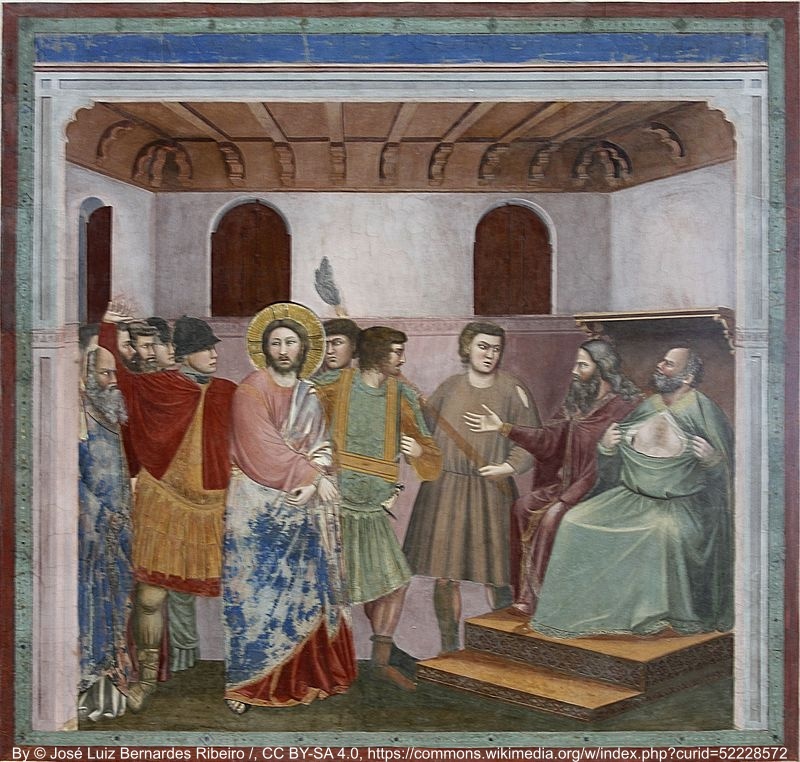 One famous portrayal is located in the Scrovegni Chapel in Padua, Italy (outside Venice). 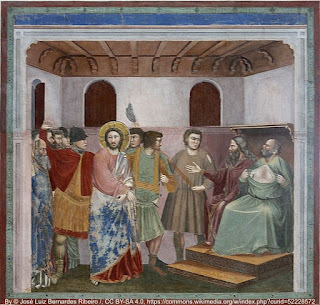 The interior of the chapel was painted by the early Renaissance painter Giotto and dates to c. 1305. Though not as developed and awe-inspiring as later High Renaissance art (ca. 1500), this painting depicts an early attempt to portray perspective (depth) and a more natural lifelike world from which later artists would learn and progress. For those interested in historical studies, particularly art history, the chapel is well worth the visit. Caiaphas is the seated figure who is tearing his shirt at the testimony of Jesus as noted in Matthew 26:65. 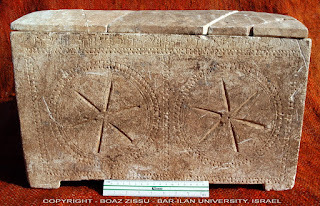 For other similar correlations between the biblical text and ancient sources, see Bible and Archaeology - Online Museum. For years, some scholars have doubted the claim of excavators working at et-Tell that they had discovered Bethsaida (see my explanation here). But as the years went by, and archaeologists continued to come up empty (of significant remains from the right time period), they doubled down and their voices became more shrill in their defense. Succeeding excavation reports were titled Bethsaida I, Bethsaida II, Bethsaida III, Bethsaida IV, etc. Archaeologists think they may have found the lost Roman city of Julias, the home of three apostles of Jesus: Peter, Andrew and Philip (John 1:44; 12:21). A multi-layered site discovered on the northern shore of the Sea of Galilee, in the Bethsaida Valley Nature Reserve, is the spot, the team believes. The key discovery is of an advanced Roman-style bathhouse. That in and of itself indicates that there had been a city there, not just a fishing village, Dr. Mordechai Aviam of Kinneret College told Haaretz. What the archaeologists found at el-Araj is an older layer dating from the late Roman period, the 1st to 3rd centuries C.E., two meters below the Byzantine level. That Roman layer contained pottery sherds from the 1st to the 3rd centuries B.C.E. [sic; should be C.E. ], a mosaic, and the remains of the bathhouse. Two coins were found, a bronze coin from the late 2nd century and a silver denarius featuring the Emperor Nero from the year 65-66 C.E. And has a major missing church been found too? The excavators found walls with gilded glass tesserae for a mosaic, an indication of a wealthy and important church. Willibald, the bishop of Eichstätt in Bavaria, visited the Holy Land in 725 C.E., and in his itinerary, he describes his visit to a church at Bethsaida that was built over the house of Peter and Andrew. It may well be that the current excavations have unearthed evidence for that church, say the archaeologists. The article continues to discuss significant evidence that indicates the level of the Sea of Galilee was 6 feet (2 m) lower than previously believed. Personally I think it’s best to continue to be cautious. There’s no sense (for those not writing headlines or raising funds) in making the same mistake again in the identification of Bethsaida. But it’s certainly fair to say that the geographical and archaeological stars seem to be in alignment. UPDATE: The story is also reported in the Jerusalem Post and Ynet (Hebrew). The Preliminary Report for the 2017 excavation season at Tel Kabri has been posted. ABR has provided a brief overview of discoveries at Shiloh this year. Remove the tarps and launch the drone and this is what the excavations of Gath look like after this year’s digging was completed. Israel’s Good Name reports on a university field trip to Tel Aroma and Mount Gerizim, including his encounters with birds and boars. A team from Biblical Illustrator has made multiple trips to the Middle East to take photographs for their magazine. The British Museum has uploaded a 3D model of the Rosetta Stone. The IAA arrested five antiquities dealers in Jerusalem on charges related to selling $22 million of antiquities to Steve Green. The Met has turned over to authorities a bull’s head that may have been looted from Lebanon. Authorities seized an ancient Greek krater from the Met on suspicions it was looted from Italy. Ferrell Jenkins explains the significance of Tisha B’Av. Amnon Ben-Tor, who has been excavating at Hazor since 1957, is interviewed on the LandMinds Podcast. Insights from Archaeology by David A. Fiensy has just been released by Fortress Press. The publisher’s site includes a free article from the book. It’s not easy picking just one. The happy reality is that, except for little surveys like this one, we don’t have to. Beautiful vistas abound in the biblical lands, if only we can climb to the summit. I loved the view overlooking Sea of Galilee towards Capernaum. In addition to the view, what made this tops for me was the climb down using the chains. So many places connected to historical events are visible from this one vantage point. The last time I was there Mt Hermon was visible. Seeing the geography, the topography, how the locations are in relation to one another is just amazing. I love the bird’s eye view but admit my stomach does flip flops looking straight down! A favorite faculty member from my Bible Institute days preached a message regarding "The people who walked in darkness have seen a great Light" from Isaiah 9. Nice climb, good heights, potential danger, lots of periods of history (OT, NT, Zealots, Crusaders) visible. I can think of no other place where a person can see where so much biblical history took place. It is a view that Yeshua knew well. It is really difficult to pick only one! While there may be more beautiful vistas, like Arbel, I love being on top of Azekah and reading I Samuel 17. It was one of the first locations for me where the Bible came to life and a treasured story became more real. It is a joy to bring others there and see them experience some of that. It is a moving experience to visualize such a familiar story unfolding in the Elah Valley below. It's something that just can't happen unless you visit Israel and set foot in a place like Azekah. Perhaps the most interesting response (in my estimation) was the reader who chose the “sunrise over moab” for the reason that they can see it “from my bed.” I wonder how places there are where that’s possible! I figured I'd choose something different. Mt Meron is great because you can see from Mt Hermon and Mt Bental in the north all the way to Mount Carmel in the south. This provides a great view of practically the entire Galilee region (on a clear day). A variety of other sites were selected, including Belvoir (“beautiful view”), Hippos, Masada, Mount Gilboa, Nazareth, Nimrod’s Castle, Qumran, and Tel Jezreel. I have been several times and have never seen more than one or two people there. I like the loneliness of the site, especially at sunset. A good place to reflect on the last days of John the Baptist. Great views of the Dead Sea and the hills of ancient Perea. Gradually the city's lights come on. I noticed the green lights all around in the city. Then the Muslim hour of evening prayer began and the muzzains calls blend and compete. A delight for eyes and ears. If you haven’t yet “panned the panorama” from all of these vistas, you can add them to your list for the next time you’re traveling through the biblical world. Many of my favorite stops in touring around Israel are viewpoints. Whether it’s on top of a mountain or a mosque, a cliff or a convent, an overlook of the biblical landscape captures so much from one vantage point. I thought that this week we would solicit your perspective on the best vista on your itinerary. The site can be in Israel or any other biblical land. If you would like, you can explain why the overlook is your favorite. We’ll share some of the results later this week. To prime your thinking, here are some vistas I have enjoyed. Email readers may need to click through.